* Thank you to everyone who participated! – An event summary will be circulated soon to FOCA Members. 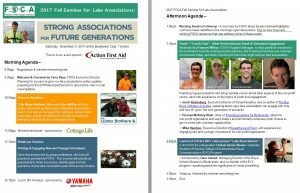 “Strong Associations for Future Generations” is our feature event for Fall 2017. Join us for a day filled with inspiring stories and new ideas about ways for lake associations to find and engage volunteers. 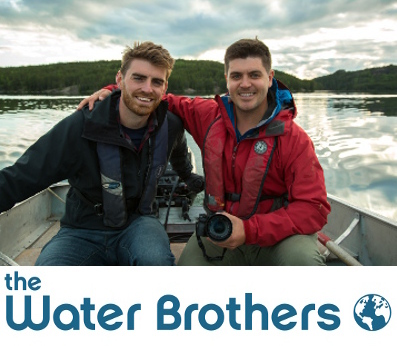 We are very pleased to announce our keynote speakers at this event will be Alex Mifflin and Tyler Mifflin, “The Water Brothers.” Alex and Tyler are the creators & hosts of the award winning television series, The Water Brothers. At the FOCA Fall Seminar on November 4, 2017, they will share stories about their acclaimed eco-adventure documentary series, their time as Georgian Bay cottagers, today’s water challenges, and the essential role of young people to implement emerging solutions over the coming generation. Also at the 2017 FOCA Fall Seminar: Video release of the short film, “Lake Associations,” by Chelsie Xavier-Blower of Fleming College’s Environmental Visual Communications program, created in collaboration with FOCA and our members. The video launch will be introduced by Dave Ireland of ROM Biodiversity and Fleming College Environmental Visual Communications program. With a focus on finding and engaging new & younger lake association members, we encourage all our members to bring your success stories from the past summer, as well as your burning questions, for some peer-to-peer discussion. View the event poster (PDF, 1 page) for a brief overview you can print or share digitally with others.